The new Kawasaki Side x Side is capable and comfortable, ready for adventure or your toughest jobs. 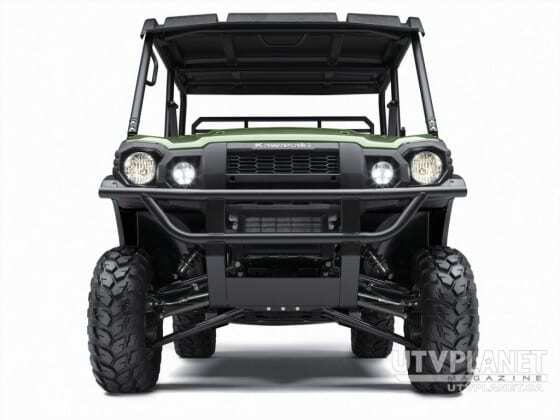 The all-new “King of Mules” is the 2015 Kawasaki MULE PRO-FXT™. 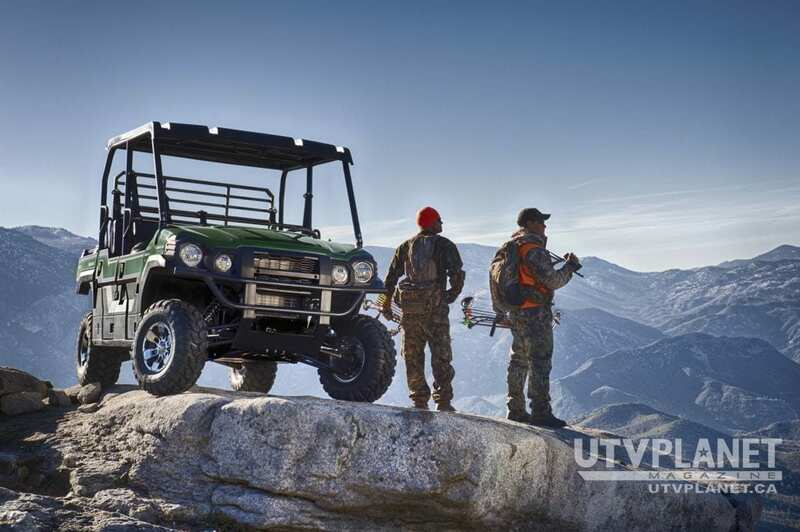 This highly capable unit mixes Side x Side versatility with class-leading torque, making it the fastest and most powerful MULE ever. 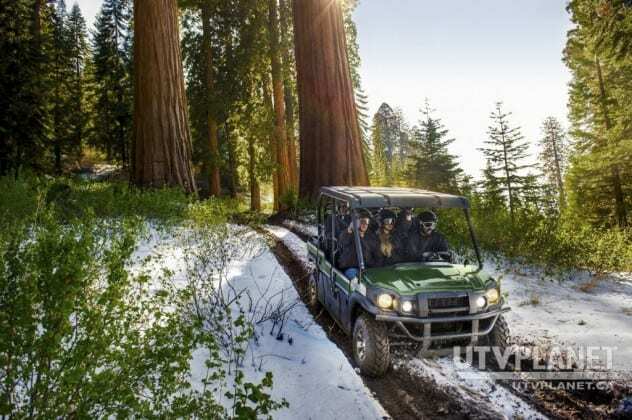 It also has a new configurable Trans Cab seating for three or six passengers and a standard Kawasaki STRONG three-year warranty, along with more comfort and convenience features than ever before. The Kawasaki MULE PRO-FXT is a leader in torque with a new 812cc, three-cylinder engine that produces a stump-pulling 48 ft-lb(2) and is mated to a specially tuned Continuously Variable Transmission (CVT). In addition, the MULE PRO-FXT has a short overall length and wheelbase, making it more maneuverable than the competition. This new chassis delivers a tight turning radius, large bed capacity and outstanding towing ability. 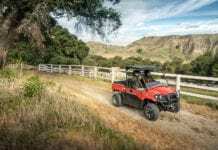 With its roomy interior and Roll Over Protective Structure (ROPS), the MULE PRO-FXT will keep passengers secure and comfortable on the farm, worksite or trail. 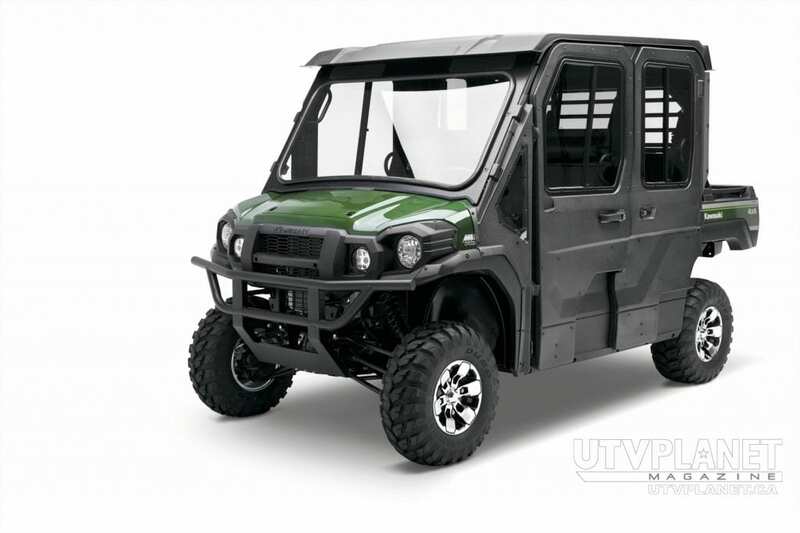 The MULE PRO-FXT is the first to lead the charge as Kawasaki continues to develop its existing and future models in the Side x Side market and grow its US manufacturing plant in Lincoln, Nebraska. The company is also celebrating 40 years of history and the very first Side x Side on the market. 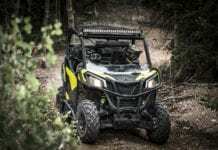 These latest developments ensure the MULE continues to be Kawasaki STRONG and recognized as the market leader. 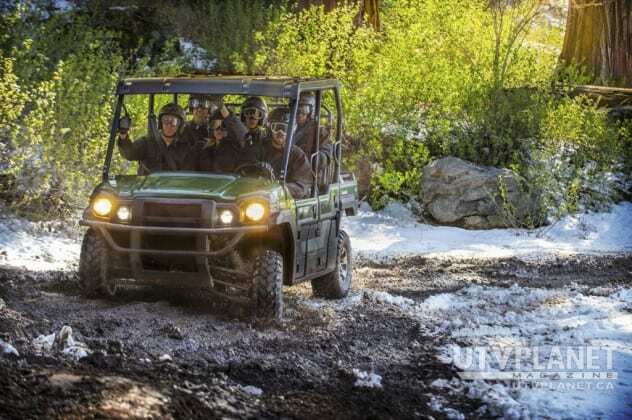 The strength of the Kawasaki MULE PRO-FXT starts with 48 ft-lb(2) of torque from its new 812cc, three-cylinder engine that has been tuned to deliver optimum performance throughout the rev range. What’s more, this is the most powerful and fastest MULE ever! Digital Fuel Injection (DFI®) helps ensure the motor receives crisp and clean fuel delivery from its large 7.9-gallon fuel tank. This gives the new MULE PRO-FXT extended range for all-day adventures or a full day at work. Transferring the engine’s performance to the ground is a specially tuned CVT transmission that was designed for the impressive 48 ft-lb(2) of torque and also provides natural engine braking to help when descending slopes. It delivers the low-range pulling power Side x Side owners expect. 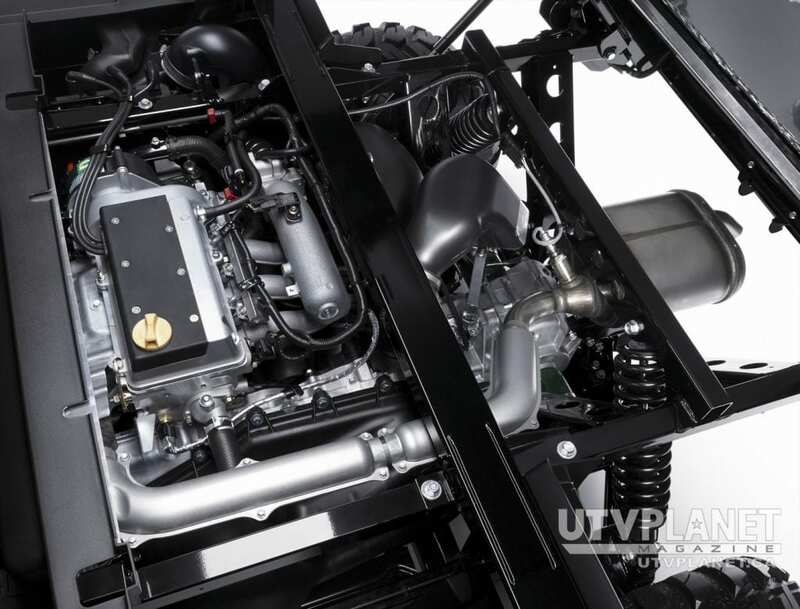 The new CVT is combined with an electrically selectable 2WD/4WD system that has a dual-mode rear differential. Convenient dash-mounted switches allow the driver to instantly engage the systems giving full control over the 4WD and the locking rear differential. 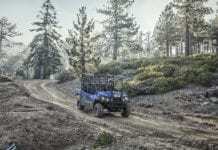 The dual mode on the differential allows it to be fully locked for maximum traction, but it will minimize its impact on the terrain when unlocked. Equipped with this system, your work can be completed quickly and efficiently, no matter the type of terrain or type of job you tackle. This strength and versatility could only be put to use by a vehicle with the handling and maneuverability to match. 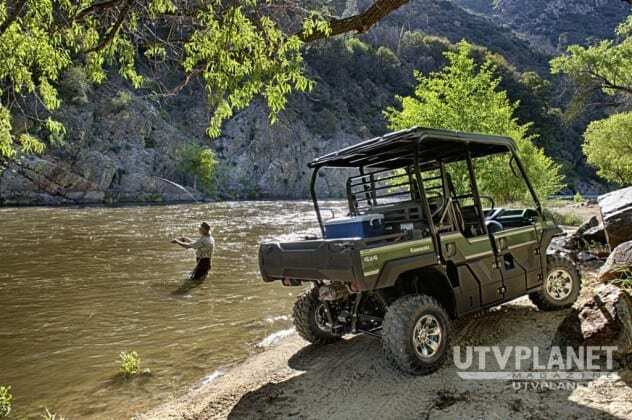 The MULE PRO-FXT delivers in all the key areas with a shorter overall length (133.3”) and wheelbase (92.3”) when compared to the competition. 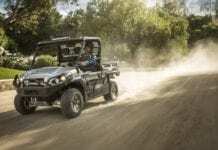 The EPS, EPS LE and EPS CAMO models of the MULE PRO-FXT Side x Side take full advantage of speed-sensitive Electric Power Steering (EPS), which helps the driver enjoy a tight turning radius of just 16ft. In addition, less steering effort is felt whether you are creeping along or throttling down the trail. 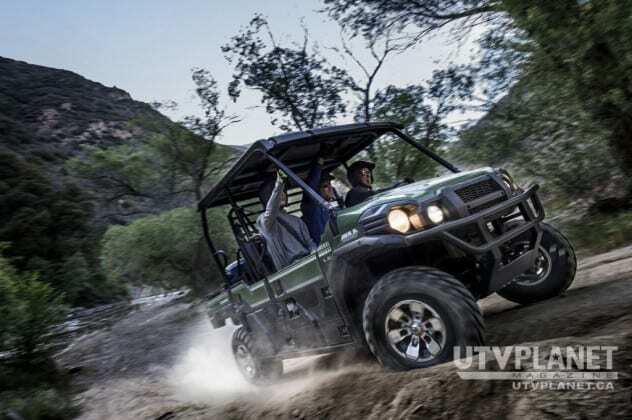 Extra ground clearance (10.2”) gives the driver confidence that the lower chassis will clear rocks and large obstacles, while the EPS has been calibrated to reduce kickback when traversing rough terrain. The front and rear independent suspension travel is a generous 8.7” (left rear is 8.5”) thanks, in part, to the twin-tube, preload-adjustable shocks found at each corner. The MULE’s durable A-arm design utilizes large diameter tubing, with rubber bushings at the attachment points. This helps to further isolate some of the steering kickback while providing fewer parts to wear out. As a result, the Kawasaki MULE PRO-FXT will outlast and outperform the competition, just as the rest of the MULE lineup has consistently done over the years. It also exploits the Roll Over Protective Structure that increases the stiffness of the entire chassis, giving the driver superior handling and driving characteristics, while also ensuring long-lasting durability and occupant security. The new comfort and convenience features of the MULE PRO-FXT give the interior a premium feel. The cockpit was designed for drivers who need to travel efficiently with passengers, along with all their necessary gear and accessories. Owners will appreciate the thoughtful design, which is apparent as soon as you sit on the new front and rear bench seats that each seat three people and provide plenty of comfort for all the occupants. The seating also allows the passengers to easily move around the spacious cabin. All passengers are secured in the MULE PRO-FXT side x side by three-point harnesses and four automotive-style doors as standard. These increase protection for the occupants both in terms of safety and from the outdoor elements. The doors are also far easier to use than nets, making the occupants’ experience significantly more enjoyable with the MULE PRO-FXT. The new comfort and convenience features of the MULE PRO-FXT give the interior a premium feel. For the driver’s convenience there is a tilt-adjustable (except Non-EPS models), thick grip steering wheel, which provides up to 40-degrees of adjustment. Or it can be tilted out of the way to facilitate access to the cabin. All passengers have secure handholds throughout. Occupants will appreciate the new storage space under the front seat. 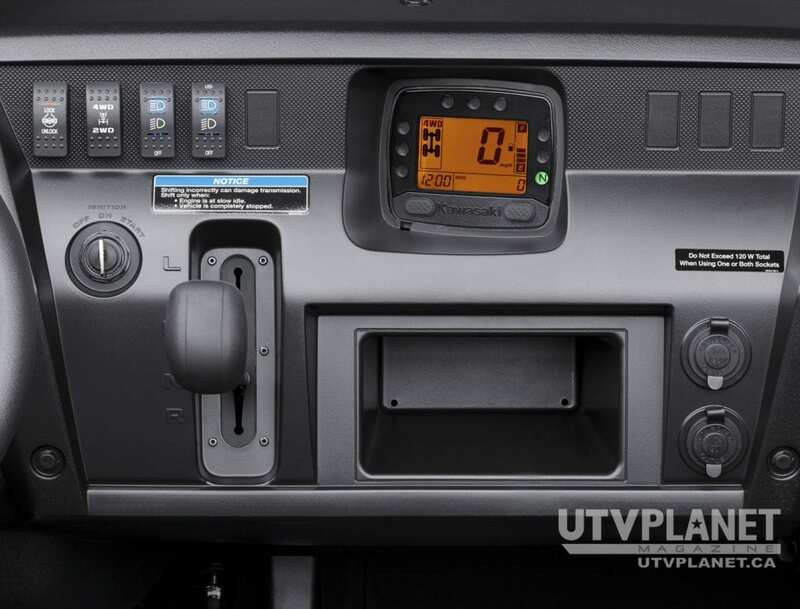 This space allows users to store their equipment and gear in the optional Kawasaki Genuine Accessories bins. In addition, there is a handy glovebox as well as three dashboard pockets – with the center pocket large enough to accommodate the Kawasaki Genuine Accessories audio system – and two cupholders built into the bodywork in front of the dashboard. The final interior feature is an all-new multi-function LCD instrument cluster. It provides a large, intuitive, easy-to-read display that includes an array of information from speedometer, odometer and hour meter to fuel gauge, dual trip meters, 2WD/4WD indicators, clock and much more to keep the driver fully informed at a glance. 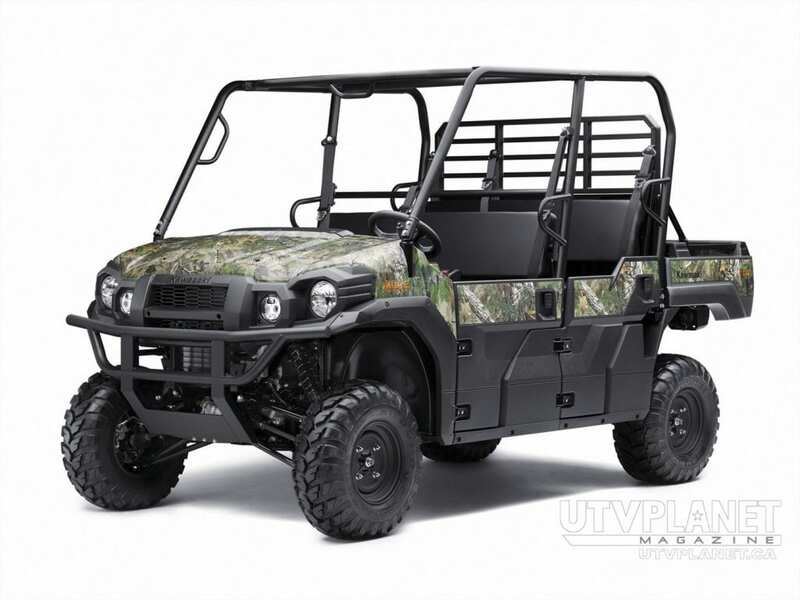 One of the standout features of the new Kawasaki MULE PRO-FXT has to be its new Trans Cab seating arrangement. It is a 1:1:1 system that allows one person to convert the seating with one trip around the vehicle in less than one minute. 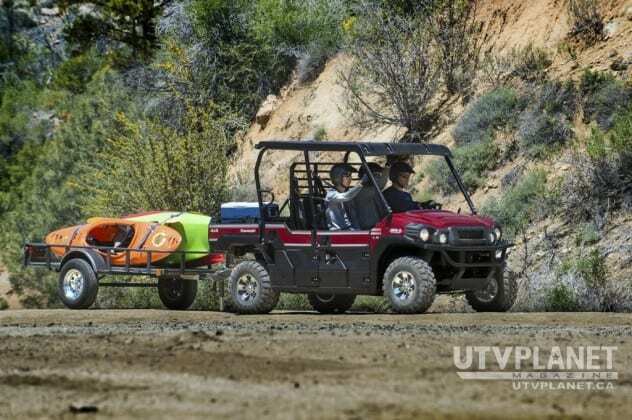 In fact, one person can easily convert the comfortable three-passenger machine into a spacious six-passenger workhorse quickly and without tools. To convert from 6-passenger to 3-passenger mode, you simply unlatch the rear seat and fold it away, slide the cargo wall forward, lower the cargo wall struts and re-attach the seat latches. With this Trans Cab feature, the cargo bed length is easily increased from 22” in the six-passenger configuration, to a whopping 42.7” in the three-passenger layout. That’s significantly more storage space and a greater cargo load capacity for the times when it is more important to haul equipment than your closest friends. Of course, the width of the steel bed does not change in either configuration. It measures a cavernous 53.7”, which should accommodate everything from the largest loads to items like hay bales. And, furthermore, there are integrated steel cargo bed rails and plenty of Kawasaki Genuine Accessories to ensure your load is firmly secured. So whether you’re on the work site and need extra cargo capacity, or heading to the campsite with five friends and family, the flexible seating and storage options of the Trans Cab on the MULE PRO-FXT means you will get the job done, no matter what the day brings. The Trans Cab system further reinforces the versatility of the MULE PRO-FXT, confirming it is the most practical vehicle in its class. One of the standout features of the new Kawasaki MULE PRO-FXT has to be its new Trans Cab seating arrangement. Passengers can power their accessories during all-day adventures thanks to a multitude of built-in 12-volt outlets. These are powered by the high-output alternator, which delivers an incredible 60.8 amps at 2,000rpm (with the headlights on). Each passenger can take advantage of the additional outlets to power everything from phones and tablets to GPS devices and other technology you can’t be without. All MULE PRO-FXT models include two 12V power outlets up front that will supply up to 120 watts, while the LE and CAMO models provide an additional two outlets in the rear of the vehicle. This should give occupants the opportunity to charge their favorite devices. 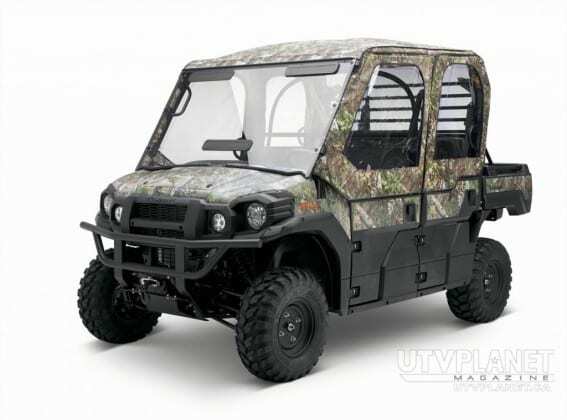 The same high-power alternator is also responsible for providing excellent visibility after dark and in poor weather conditions by powering the Hi/Low halogen headlights that come as standard equipment to match the performance of the “King of Mules.” Additionally, the LE and CAMO models in the MULE PRO-FXT range get high-intensity, auxiliary LED headlights for even greater illumination (available as accessories on other models). 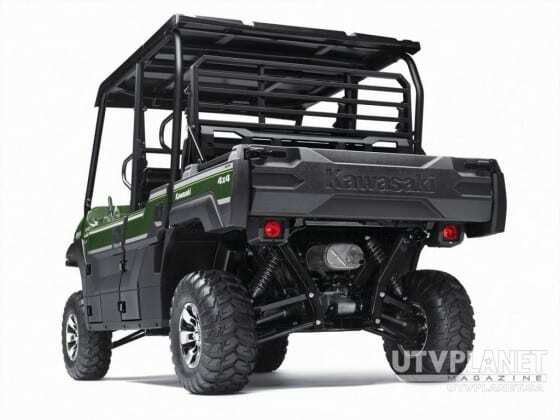 LED lights are specified on most high-end machinery for their extremely bright output, although Kawasaki’s engineers were also interested in the extended durability and low current draw that LEDs offer. So for the brand new MULE PRO-FXT, it was only natural that top-of-the-line LED products would be used for this top-of-the-line application. With a maximum load capacity of 1000 lb (in three-passenger mode, where permissible according to state law), the ultra-durable steel cargo bed on the MULE PRO-FXT can accommodate all your equipment, personal gear and essential items. The tilt bed features a hydraulic assist and incorporates integrated steel cargo bed rails to allow tie-downs and genuine Kawasaki-specific accessories to be quickly deployed. Furthermore, integrated cargo dividers mean you can quickly separate your tools and personal gear. Enhancing the carrying capacity of the MULE PRO-FXT is an integrated 2” hitch receiver. 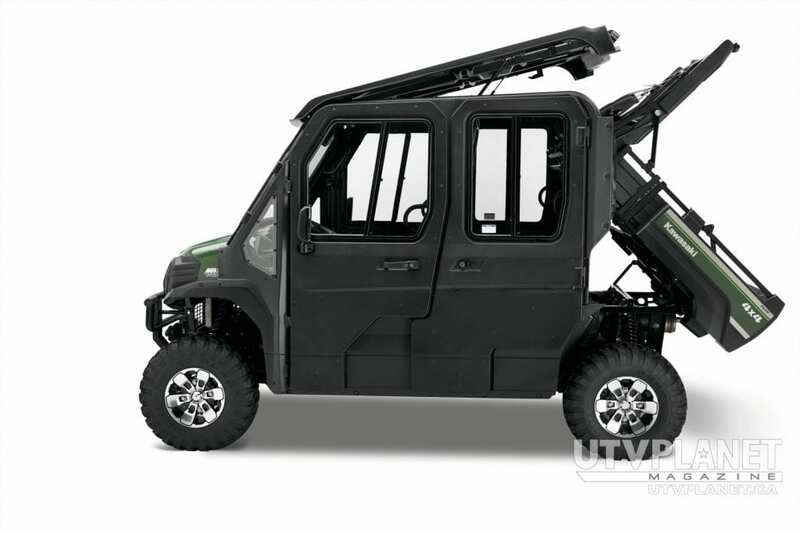 When equipped with an optional draw bar, it is able to tow a substantial 2000 lb load (where permissible according to state law) with the pickup truck-style receiver, giving the new Kawasaki the ultimate crossover capability. 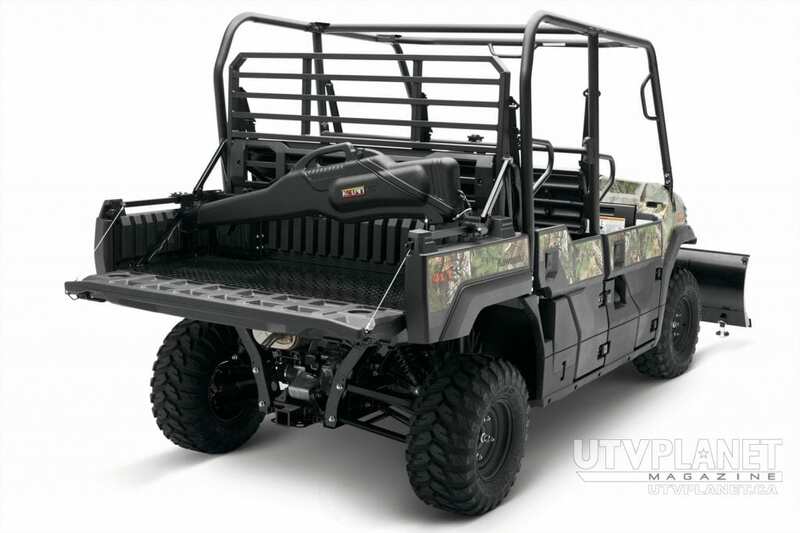 With a maximum load capacity of 1000 lb (in three-passenger mode, where permissible according to state law), the ultra-durable steel cargo bed on the MULE PRO-FXT can accommodate all your equipment, personal gear and essential items. In order to successfully haul such large loads, hydraulic disc brakes use 212mm rotors on all four corners. They combine with a dependable engine braking system to produce effective stopping power anytime, anywhere. Dual-piston calipers in the front, and single-piston calipers in the rear, give the driver strong yet progressive stopping power. An integrated mechanical rear parking brake was also included. 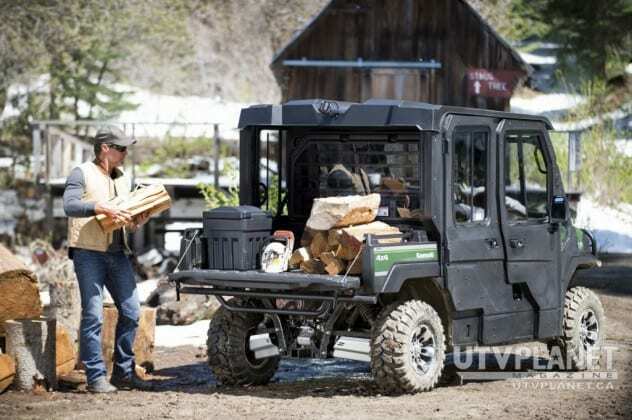 Utilizing the braking system, it keeps the MULE PRO-FXT securely in place when stopped. The MULE PRO-FXT comes in four models, each one packed with a host of Kawasaki STRONG features. The Non-EPS model comes standard with steel wheels and two DC outlets in the cab. It is available in the Super Black finish. The second variation in the PRO-FXT lineup is the EPS model. This comes standard with the same amenities as the Non-EPS but with the addition of Electric Power Steering (EPS) and a tilt steering wheel. This model is available in Timberline Green and Super Black with a contrasting graphic along the doors and cargo bed. Next in the range is the desirable EPS LE. This variation comes standard with a host of additional upgrades over the EPS model, including LED headlights, aluminum wheels, a composite sun top and two additional DC outlets for rear-seat passengers. Color options are Timberline Green and Dark Royal Red with a contrasting graphic along the doors and cargo bed. Last, but certainly not least, the MULE PRO-FXT is available with Realtree Xtra® Green Camo, which gives the avid hunter the ultimate color scheme for any adventure. 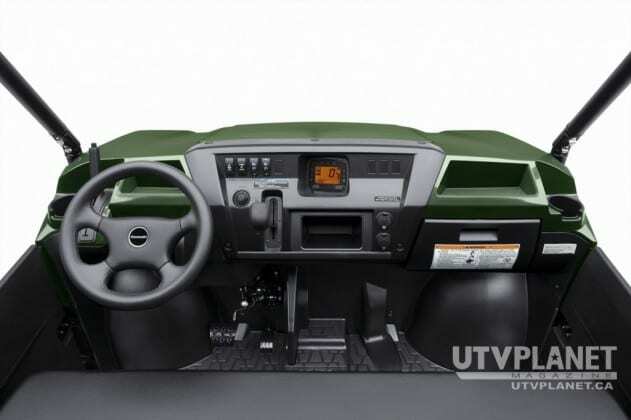 The Camo model includes EPS and tilt steering function. In addition, LED headlights and four DC outlets round out the Camo package. 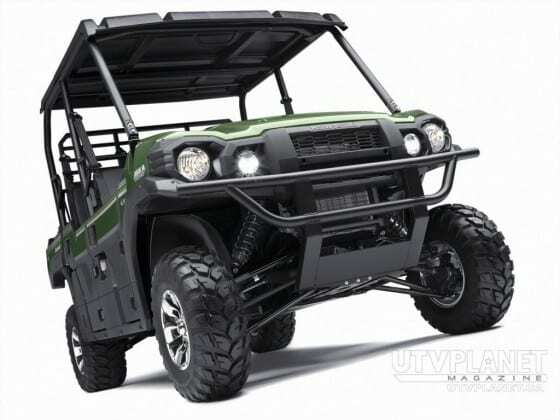 Owners of the new Kawasaki MULE PRO-FXT will enjoy the opportunity to accessorize, colorize, and specialize the vehicle to accentuate their individual style. Owners wishing to accessorize their vehicle can take advantage of more than 60 Kawasaki Genuine Accessories, including three special packages that will be available for the MULE PRO-FXT. Owners might like to obtain a Kawasaki-certified WARN® winch package, for example. Or you could opt for a WARN® ProVantage™ Plow System to tackle winter storms. In that case, you might also choose to provide extra protection for the vehicle, equipping it with both skid plates and brush guards. To protect the occupants from the elements, Kawasaki offers everything from hard and soft roofs, to full and half windshields as well as hard or soft cabin enclosures and doors. And all these Kawasaki Genuine Accessories were developed alongside the vehicle, for the perfect installation, fit and finish. MULE PRO-FXT owners can also choose from accessories such as a half windshield, audio system, heater, bed extender, cargo divider, dual battery kit and so much more. As an added bonus, the industry-leading Kawasaki STRONG Three-Year Warranty remains intact after the purchase and installation of any of these accessories, which were all developed and tested along with the machine itself. 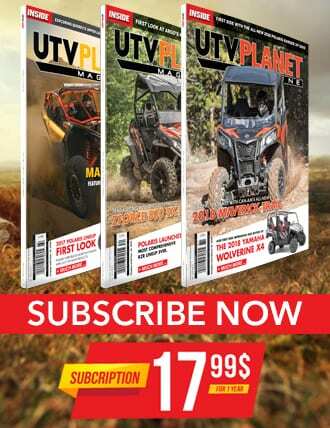 Consumers interested to see how their new MULE PRO-FXT will look with Kawasaki Genuine Accessories in place will now be able to build their vehicle online, adding their favorite accessories and seeing them in place. They then have the opportunity to print their custom build list and take it to their local Kawasaki dealer to purchase the exact vehicle specification they designed. Visit www.kawasaki.com for full details. Customers can take pride in the knowledge that the new MULE PRO-FXT is assembled from foreign and domestic components right here in America at Kawasaki’s manufacturing facility in Lincoln, Nebraska. Completing the appeal of the MULE PRO-FXT is Kawasaki’s promise to keep you running Strong with our standard Kawasaki STRONG Three-Year Warranty. We don’t just want you to enjoy the “King of Mules,” we want you to live the MULE lifestyle and be inspired by its heritage: a heritage of powerful, durable, fun-to-drive vehicles. 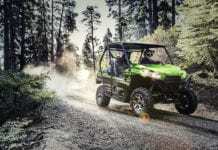 For more information on the Kawasaki Mule PRO-FXT, please visit the Kawasaki Website.